Gado gado, Indonesian vegetable salad with creamy peanut sauce and emping crackers. If you are vegetarian, this recipe might be useful for you. It contains only vegetables, none of meat or cheese or any other animal products, so it’s completely safe except that we use eggs for serving, but you can leave it out easily. The taste would be same. But for you if you’re on diet, this might be not a good vegetable salad for you. Peanuts sauce has big calorie which is not fit on your diet plan. 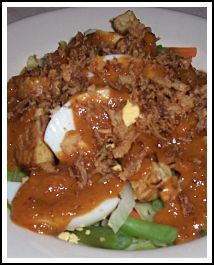 Gado gado is pretty flexible dish. You can serve it with Ketupat or white rice or even without them. You can eat hot or cold. You can use this vegetable salad for the evening meal or lunch, or you can take away for a day out at the zoo or to the park. It’s handy and healthy salad regardless the calorie of the peanuts sauce. This dish is certainly very popular outside Indonesia. You have plenty of variation and you can buy it everywhere if you have no time to make it. Indonesian restaurants in the whole world serve this kind of dish. This Indonesian salad is loved by everyone. This is a family meal that would please every single member in your family. Try it and you can use as many vegetables as you want. 1. Make a spice paste of baked Garlic, Onion, and chilli pepper. 2. Put the paste in the pan, add Peanut butter, mix it, add Tamarind water, Sugar, Trassi, Salt and bouillon powder. Mix them until well, if the mixture too thick add some water until you get the mixture like the mix for pancakes, not too thick or too thin. 3. Put the pan into the low fire, add kaffir lime leaves. Squeezed the leaves first before you add them. Let them cook at low fire, stir it occasionally to make sure that you don’t get the burn parts at the bottom of the pan. 4. All vegetable boiled lightly, separately, drain it. 5. Arrange all vegetables on the dish, add some baked tofu, potatoes and boiled sliced eggs. Pour the peanuts sauce over this. Then decorate with fried onions.